Browsing around the www a while back, I came across something that I want to share with You . 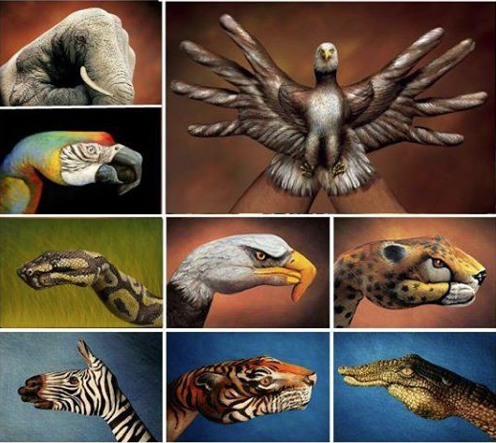 . . check out some of the extraordinary Hand Art by Guido Daniele, shown above. Not being as clever and creative as Guido, I have simply painted my left hand . . .
FYI: I plan to display more of my own paintings on this blog as soon as I gather suitable photos. 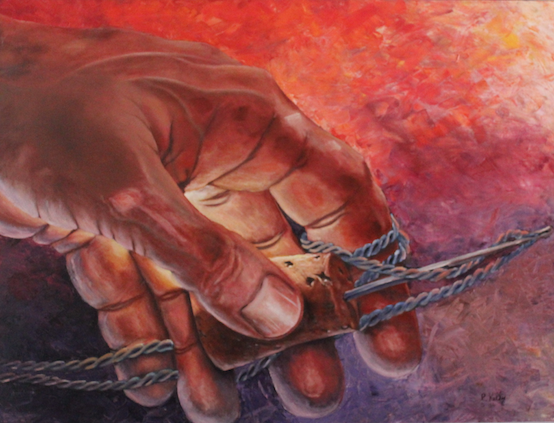 This entry was posted in Miscellaneous Musings and tagged art, hand painting, painting, painting hands. Bookmark the permalink. Thanks for dropping by. You are one of my few regular readers, and I appreciate the kind words. I’ve neglected my artistic hobbies for quite a while, and now thinking of devoting more time in that direction. Virtually all paintings on hand are ones I started years ago and never have gotten around to finishing. Perhaps I can post some of them as “Unfinished Works”, or something like that.